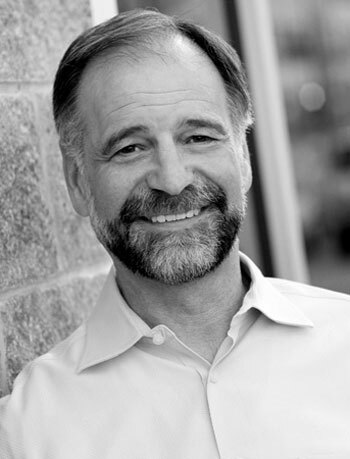 William Wenk, FASLA, is the founder and president of Wenk Associates. This interview was conducted at the ASLA 2014 Annual Meeting in Denver. Denver has made great strides in its efforts to become one of the more sustainable cities in the US. What have been the major successes over the past 20 years? Where does the city still need to make progress? The urban corridor, along the front range of the mountains between Colorado Springs and Fort Collins, is one of the fastest growing metropolitan corridors in the country. The most significant improvement has been the new regional light rail network that Denver Metro area voters approved approximately 10 years ago. This system has generated opportunities for transit-oriented developments (TODs), a” hub and spoke” system well on its way to being built out. It will be one of the most comprehensive in the country. The goal is to create more urban environments on sites often found in a suburban context. In the heart of Denver, there has been tremendous interest in development at the rail stops. But increased density along the rail corridors can’t possibly handle the levels of growth and need for housing. In addition — with the exception of a few light rail stops — the expansion of transit in the heart of Denver is proving to be especially difficult. A number of established neighborhoods are being transformed by much denser infill development where there’s no transit other than our bus system, which isn’t very well-used. Increased density, especially in older central city neighborhoods, has been tremendously controversial. For example, the Cherry Creek District, which is an upscale shopping area two miles from downtown Denver, is achieving urban density, but isn’t served by transit. The same is true for the Lowry infill, New Urbanist development, where higher densities are being criticized because of increased traffic in surrounding streets. Controversy surrounding increased densities in the center of Denver will continue to be an issue for years. To provide a better transit option the heart of the city, Denver is considering on-demand transit or circulators, which Boulder has found to be very successful. A system of circulator buses in Boulder called the Hop, Skip and Jump, has been a hit. We also have Zipcars and BCycle, our bike share system, that provide other options to owning a car, especially in areas close to the downtown. Because we’re such a car-oriented city, getting a typical family to shift from two cars to one car is a big deal, in spite of all of the innovations to date. The state’s population is increasing at about 2 percent per year. As a result, we are once again seeing sprawl — low-density development at the urban fringes. Since 2008, sprawl had slowed down considerably, but it has been heating up again. Among the city’s sustainability goals: by 2020, Denver seeks to increase transportation options so only 60 percent of commuting trips are made by single-occupant vehicles. How will the city achieve this? Is compact urban development the way forward here? Colorado has 5 million people now but is projected to grow by 2 million people in the next 15 years. Accommodating that level of growth is going to be an enormous challenge. Colorado is a very popular destination to move to both for Millennials and Baby-Boomer seniors who are following their kids who now live here. We have daunting issues related to growth along the front range, which is where most of the growth will occur. We can’t accommodate it all with denser infill development, although there are currently thousands of units of apartments under construction right now in the heart of Denver. We’ll also see more units coming in the TODs along the light rail system. 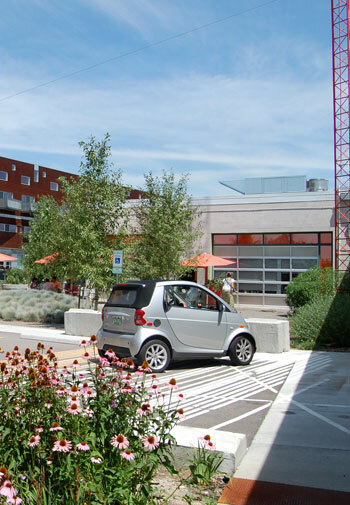 Some of the most dramatic examples of growth are in aging industrial areas near downtown Denver. For example, we’re currently working on the Brighton Boulevard corridor, the spine of an old industrial area that is rapidly transforming into a hip mixed-use arts and tech-oriented district. Developers in the area are insisting we incorporate bike lanes, broader sidewalks, and stormwater treatment in the right of way. Unlike many older coastal and Midwestern cities, Denver’s not being pressured by the federal government to improve stormwater quality to the degree that these older cities are. Instead, the development community has really been pushing the city to innovate to create green infrastructure systems that also enhance the public realm at a district scale. It’s a very interesting time here, as we re-imagine the infrastructure in those neighborhoods that will be populated primarily by Millennials who don’t want to own a car. But multiple barriers remain. The city, in partnership with the development community, is trying to identify the appropriate finance and maintenance strategy to transform the area’s infrastructure. The city is trying to catch up with the most innovative of national trends, but they don’t don’t quite know how to do it. Denver isn’t alone in this: Most larger cities are facing the same issues. I only wish we could move more quickly, be more willing to experiment with new ideas, and implement those that prove to be most feasible on a wider basis. 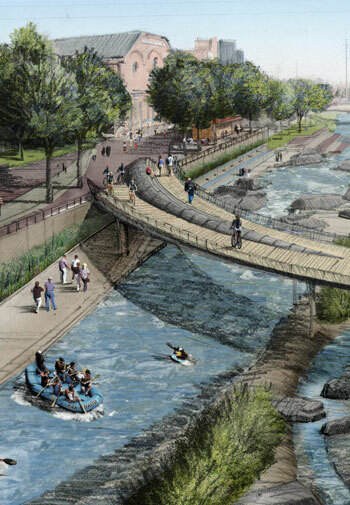 Another of the city’s goals is to make all rivers and creeks swimmable by 2020. How will the city achieve this goal? All water in Colorado is owned. It’s bought and sold as a commodity, unlike water in wetter climates. There’s an old saying: “in the West, water flows uphill toward money.” Most of the water for front range communities comes from across the Continental Divide through a network of tunnels, canals, rivers. Like most rivers in the West, the South Platte River, which flows through the heart of Denver, serves as an integral part of this network to convey water that has been historically used for agricultural use. During periods of high diversion for agricultural and urban uses, rivers can be literally drained dry. Until recently, there was no water allocated that would maintain river flows for recreation and habitat. Many rivers in the West face this issue, which will continue to be of concern far into the future because of high demands on water. 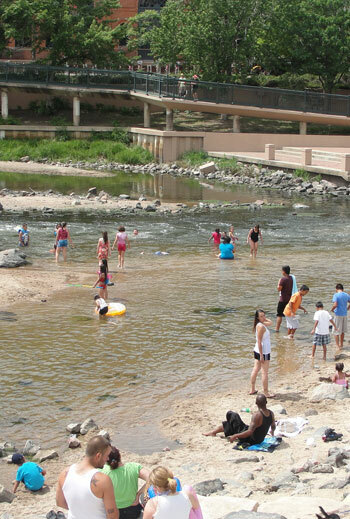 Coliform, a bacteria; metals; and nutrients are a problem in the South Platte River, as they are in many urban rivers. For multiple reasons, I think the goal of making the cities, rivers, and creeks swimmable by 2020 simply isn’t possible given how we’re approaching the problem today. It is difficult to remove coliform through passive treatment methods. Meeting that goal may always be a problem because we don’t have a complete understanding of many of the sources yet. That said, there’s a great deal that could be done if there were the political will and funding to tackle it, especially at a watershed or district or neighborhood scale. Because Denver isn’t under a federal consent decree, an improvement in the quality of urban rivers and streams will only occur through public pressure and creative means of financing and maintenance. What is really interesting is there is significant interest on the part of a growing number of developers to be more responsible stewards of our urban water resources. For example, we are currently working developers, such as Zeppelin Development, Perry/Rose, and Urban Ventures who care deeply about Denver and are saying “We’ve got to do this.” They’re putting political pressure on the city to move beyond traditional stormwater management to employ green infrastructure approaches in a way that is good for business and the environment. Millennials are looking for green infrastructure in their living and working environments. Denver Housing Authority, another of our long term clients, which has been instrumental in transforming a number of derelict areas the core city, is taking the same approach. As Chris Parr, their director of development, says “We want to be nutty green,” because they believe, as long-term owners of these projects, green approaches to development make good business sense. For example, the redevelopment of an outdated public housing project spanning several blocks at a light rail station very close to the downtown used stormwater infiltration as a primary management strategy to reduce development costs. Significant challenges remain though: Long-standing development standards for stormwater management and street design are still on the books, which limit change. According to a report published in 2014, Denver is in the top 10 for U.S. cities with the highest percentage of green commercial real estate. Is the city also moving to greener commercial landscapes? If so, can you provide some examples? We are moving towards more water-conservative landscapes. I wish to make that distinction because Denver Water, the primary regional water supplier, has emphasized water conservation for the last 20 years, resulting in at least a 10 percent reduction in water use. There is an almost universal emphasis on the use of xeriscape principles for commercial landscape design. In 2050, Colorado will have a 163 billion gallon shortage of water available for urban uses, so we’re going to have to explore further means of conservation, as well as rethinking what the larger concept of landscape means in our semi-arid climate. Because of our water laws, we cannot harvest rainwater. Much of our effluent cannot be reused for the same reasons. That said, there is great potential to transform the urban environment using more regionally appropriate, gray/green landscapes that are more integral with natural processes, which you emerging in Portland and Philadelphia as a result of stormwater mandates. There are some experimental green roofs here, but they tend to need irrigation because of our solar gain, which is counter to water conservation goals. Because of anticipated shortages, there is talk of “toilet to tap,” but given the vast majority of our domestic supply goes to landscape irrigation, we’ve only begun to explore the possibilities of a sustainable regional landscape aesthetic and ethic. Our work at Taxi is a good example of a sustainable commercial landscape. We’ve worked within Colorado water law to infiltrate stormwater. We’ve used nonliving materials extensively. The plant palette consists of a broad range of native and non-native xeric plants. Denver is in the top 10 on the Trust for Public Land’s ParkScore, which ranks cities on the quality of their park systems. What parks best exemplify the city’s commitment to providing high-quality green public spaces? Denver has one of the more notable City Beautiful-era systems of parks and parkways. It’s on the National Register. Cheesman Park, Washington Park, City Park, and Speer Boulevard are just remarkable historic resources. The system’s been expanded significantly as part of the development of Stapleton and Lowry’s park and open space networks. 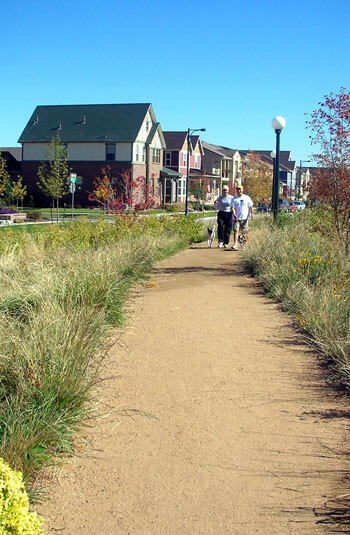 In Stapleton and Lowry, the historic Olmstedian park aesthetic has evolved to be much more regionally appropriate, in terms of incorporating large areas of more native and naturalized landscapes driven by managing stormwater on site. 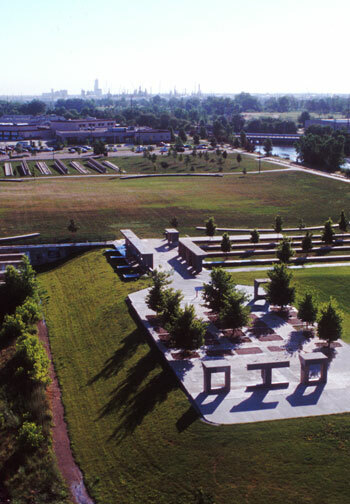 Also, the city is investing heavily in an expansion of parks and natural areas along the Platte River Greenway, which was established over 40 years ago as one of the first greenway systems in the country. 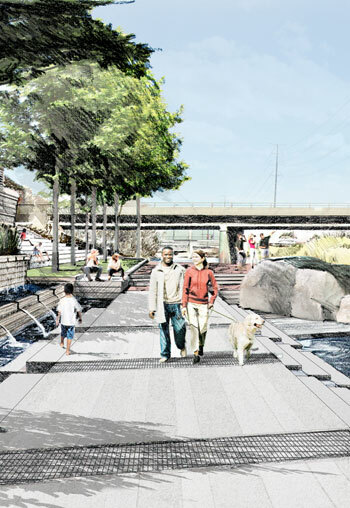 We are currently involved in the $4 million first phase redevelopment of Confluence Park along the river, which is part of a $40 million long-term makeover. Confluence has become overwhelmed with out-of-town visitors and daily users who now live in the Central Platte Valley. We’re looking at public private partnerships to create landscape architecture that better manage conflicts between bikes and pedestrians. There is a level of urban use that demands new types of management and maintenance, something you find in major urban centers but Denver is only beginning to see. There are some wonderful new parkways, especially in Stapleton, designed around the natural qualities of the West. These naturalized qualities make you feel like you’re in the West rather than in Cleveland or in Washington, D.C. Those parkways have been controversial, but people are getting used to them and see their inherent beauty. Denver Parks is looking to the future in terms of how we begin to serve our rapidly expanding population, the thousands of new residents who are going to be living downtown. Existing parks in the downtown tend to be oriented to major civic events and festivals. The master plan is proposing an expansion with a range of traditional and nontraditional park types. They seek to incentivize public-private partnerships, which will lead to more private parks in ways that you see in the core of Manhattan — streets as parks, pop-up parks, for example. Bicycling Magazine ranks Denver 12th in the country for its bicycle infrastructure, behind leaders like New York City, Portland, and even Boulder, which ranks sixth. What are the plans for improving bike infrastructure in the city? Bike use has gone up dramatically, especially for commuting, over the last 10 years. The U.S. Census Bureau ranked us in the top 10 given some 2.3 percent of residents commute by bike. BCycles, our bike sharing system, has been really successful and expanded beyond the downtown. There are aggressive proposals for enhancing the cycling network downtown. Our downtown business association is currently crowdsourcing funding to physically separate bike lanes because public funding isn’t currently available. Denver Public Works department has a bicycle coordinator. There’s a major initiative to create a comprehensive system of new bike lanes and sharrows. These all are a testament to the city’s commitment to enhancing our on and off street system for our outdoor-oriented population. But in spite of all of the improvements, we have some major gaps and barriers in the system and entrenched street standards that aren’t bike friendly. These issues are going to be difficult and expensive to solve. Why is Denver so keen on adaptive reuse? Many of your projects, such as the Taxi Redevelopment and Northside Park, reimagine old infrastructure to create parks and commercial spaces the city can use today. In the late 1960s and early 1970s, we lost a tremendous number of fabulous buildings to urban renewal, like most other cities. There was huge resistance, which resulted in the preservation of Larimer Square, the establishment of a number of historic districts, and new landmark status for many remaining buildings. These efforts also spawned Historic Denver and other preservation organizations and programs that have resulted in the preservation of a number of historic districts and buildings: our warehouse district, known as Lower Downtown (LODO), is a prime example. It has been hugely successful as a real estate venture. Although we’ve lost a great number of really valuable resources, today, there is widespread adaptive reuse of warehouses and old industrial buildings. Taxi was a derelict taxi dispatch center surrounded by rail yards, along the Platte River. Our client, Micky Zeppelin, saw this gritty infrastructure as a place creative individuals wanted to live and work. He’s always been a student of cities around the world. He wanted us to be responsible about water use as part of a much broader agenda of creating a creative community. He wanted a rich environment that was both urban and natural, and one where natural processes could function in the heart of the city. Northside Park was a decommissioned sewage plant, an incredibly stout infrastructure too expensive to tear down, Our solution to retain the plant was primarily practical. We needed to reduce demolition/construction costs and create space for two soccer fields. Personally, I’ve always been fascinated with layers of history in the land — both visible and invisible — and the richness of expression that is possible by revealing those layers. Adaptive resuse is messy, but it’s a wonderfully rich way of way of thinking about the world. The world is not a clean and tidy place. The landscapes a lot of us want to live in aren’t necessarily clean and tidy, but they’re vital. They’re alive. This line of thinking can lead us toward the next generation of urban landscapes in the semi-arid West.